Stenhousemuir won’t have far to go to learn their next opponents in the Irn-Bru Cup, after seeing off Rangers in the Irn-Bru Cup second round along the road at Forthbank. The Warriors faced the Premiership colts team at the home of Stirling Albion last night and triumphed 3-1 ending a horrible run of results in the league and cup competitions for Brown Ferguson’s side. 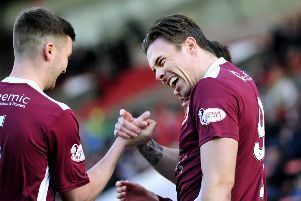 Colin McMenamin and Alan Cook gave Stenhousemuir a 2-0 lead before an exchange of goals between Ryan Hardie and Cook again ended the match 3-1 and sent the Warriors into this afternoon’s draw being held at the Kelpies. It includes Falkirk and the other nine Championship sides, plus Livingston and Alloa. However the local rivals cannot meet. Stenbhousemuir are in the southern half of the draw, with Falkirk placed with north of Scotland teams.